It’s been a busy time at the office but we had a pleasant break today when a visitor rolled in on his touring bike. Julien is from France and has been touring on his bicycle for about 4 years now. We spent a good bit of time chatting about his experiences in India and touring in general. He also had a lot of advice for us about gear. 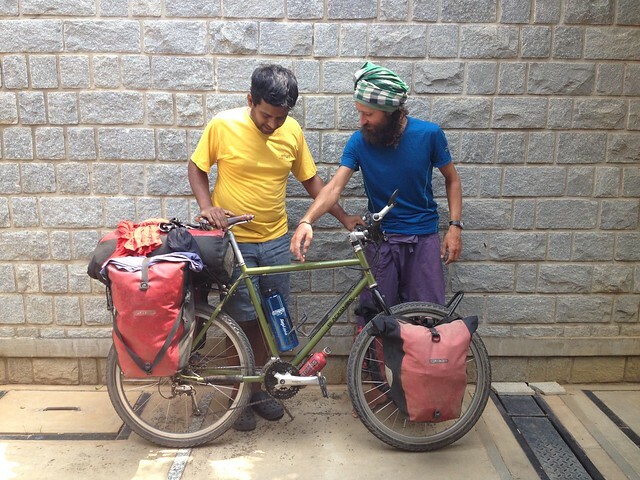 It was insightful for us to talk to someone who has basically been living off his bicycle for 4 years. Here are some tidbits. Since he cycles more than he walks, he said it takes a little getting used to regular walking when he is on rest days. He doesn’t use a cycle computer, log distance covered or use a dynamo hub. In fact, he has had his phone stolen a number of times and doesn’t really depend on having one. These tires have done more than 10,000 km! 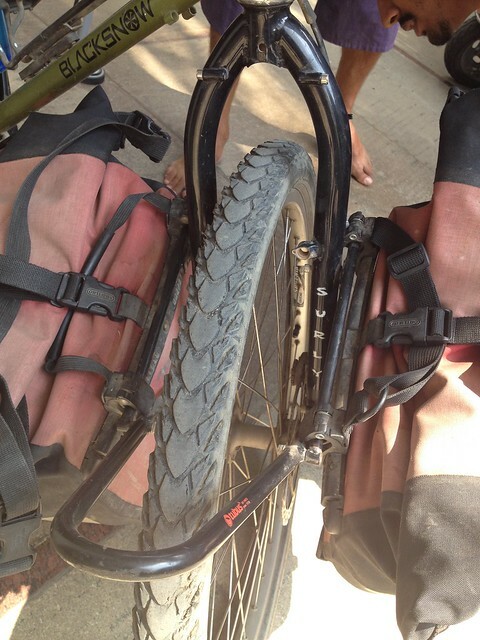 He swears by his current Schwalbe Marathon Plus Tour – his current set has lasted him since Kyrgyzstan. Since then he has been to Kazakhstan, China, South-East asia and all of India. He prefers these tires to the Marathon Mondial. 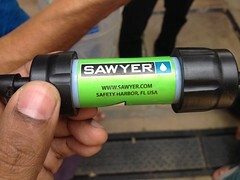 He carries a water filtration system made by an American company, Sawyer, and loves it. Says he can safely filter water for drinking from any tap or water body. On the topic of water, in addition to all his water bottles (some were large), he also has a 10L hydration pack made by MSR. He typicallly fills it up before setting up camp for the night – should cover cooking, washing and all overnight usage. In the red bottles he carries fuel – petrol or kerosene which can be used by his stove when cooking. Since even small villages have petrol available, he has no trouble refilling. His left crank arm is black and his right is silver! He needed a spare one and a bike shop spared one of a different colour – when you need to get back on the road, you take what you get. Since he basically lives off his bike, everything he uses is on it – including about 4 kgs of winter gear! We were introduced to Julien under unfortunate circumstances last June. He was camping by himself in Ladakh when a group of drunk men attacked him and his tent. He fled to return with the police but by then they had damaged his bike and gear – he was in need of a new fork among other things. 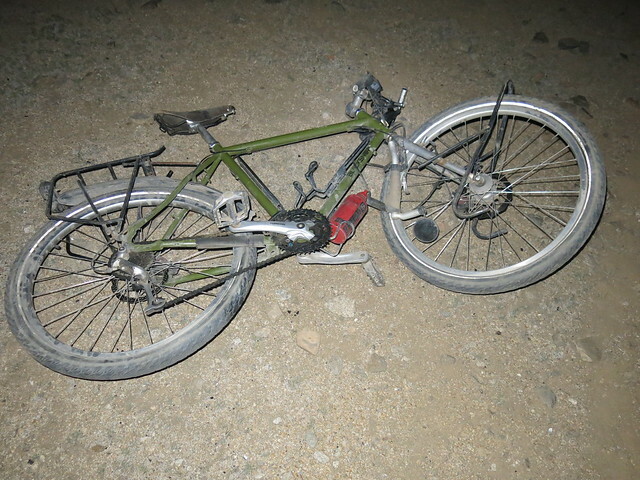 Luckily we had a Surly Troll fork that suited his bike. We were glad to see that he is happy with his replacement fork and that incident in Ladakh did not perturb him or his planned travels. He was full of praise for rural roads in India and the many friendly people he has encountered on the road. His one year visa expiring soon, Julien took leave from our premises and set out to Ooty via Mysore. From there he will proceed to Cochin before flying out of the country but he is not done with his travels yet – he is off to a new country but plans to return back to visit parts of India. We are glad for the time spent with you Julien, safe travels and may our paths cross again! Something interesting that we did today – convert a cheap triple crank to a single chainring with a Narrow-Wide chainring. This one is going on a Surly Karate Monkey build. A blog post? In 2015? Well, yes. We’ve been cleaning up house! After months of procrastination, the website has had a bit of an update. Hopefully it looks more current. We’ve also decided that blogs do have a function in the age of Facebook, Instagram and Twitter. There’s information we’d like to put out here that may be too long for social media or may prove useful enough to come back to. Feeds aren’t easily searchable when you want to look up something you saw a few months ago. So, we’ll give it a shot. Before we go. 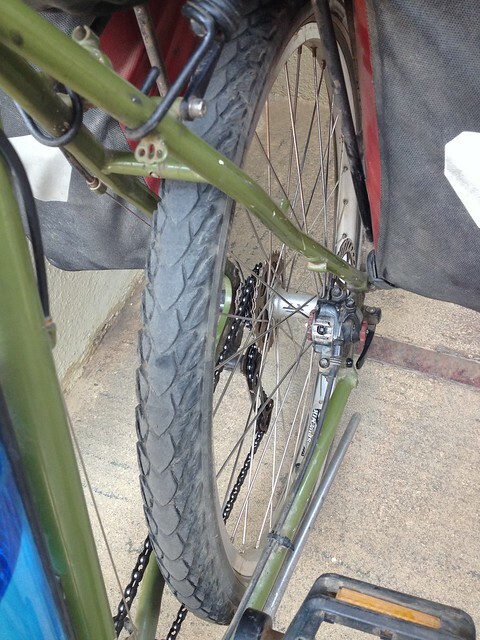 Here’s a picture of the Surly Travelers Check that we shipped yesterday. The customer sent in this photo today. It’s a special bike and we’re not likely to sell another of these for a while.